When embarking on wood projects, it is important to understand the differences in woodcuts, as well as the criticality of moisture measurement and moisture control in your wood. Regarding the wood grain, any piece of lumber has three surfaces: end grain, edge grain, and face grain. End grain is the grain of wood seen when it is cut across the growth rings. Rather than cutting a plank of wood the length of the trunk, end grain wood is actually cut at a 90-degree angle to the grain. This type of cut exposes the character of the wood rings and graining. Many wood lovers relish the results: a cross-grain which pleases the eyes and the wallets. Put simply, end grain cuts produce highly-aesthetic wood with character, color, and durability. End grain boards are typically used to manufacture butcher blocks, as an example. The end grain boards are made by cutting the pieces of lumber into blocks and gluing the blocks together with the end grain up, forming the top surface of the cutting board. This block construction makes the butcher block very strong and durable. During cutting and chopping, the end grain wood fibers absorb the impact of the knife blade so the block is resistant to nicks and gouges. One needs only reflect on the culinary punishment unleashed on chopping blocks over time to grasp the durability factor of end grain. In fact, end grain flooring tiles are a very unique form of flooring that has been used for one particular goal: durability. End grain floors were traditional floor coverings in factory buildings, heavy traffic commercial buildings, and boardwalks, to name a few applications. They absorb energy and noise, and the angle of cut allows for the growth rings to resist scraping and general wear. Wood cells hold moisture content (MC) in their nuclei and cell walls, and can give up or take on moisture quite readily depending on the relative humidity (RH) of the surrounding air. The end grain of wood absorbs and gives up its moisture at up to 100 times the rate of the face of a wood piece. If you consider that most wood cells have a roughly drinking straw-shaped structure, you can see that the moisture can travel more quickly into and out of the wood from an end-grain cut. Many wood professionals recommend sealing end grain wood to slow down the absorption, even before beginning a project. When storing wood for extended periods of time or in non-climate controlled areas, sealing this end grain is also highly recommended, especially to prevent end splits. To carry on with our butcher block example, there are two alternatives to end grain when manufacturing butcher blocks as a woodworking project. Edge grain (or vertical grain) is produced by quarter-sawing the lumber so that the edges of the growth rings are exposed on the widest faces of the piece, and the rings form angles of 45 to 90 degrees with the widest faces. Face grain is when a board has one side that is wider than the other; the wider side is referred to as the face, as opposed to the edge. This also may be referred to as the face that is to be visible in the finished product. Edge grain boards for butcher blocks are usually made of strips of wood, and after the piece of lumber has been cut into strips, there is a choice of which grain to put facing upwards. When the edge grain is up it is an edge grain cutting board, and when the face grain is up it is a face grain cutting board. The key difference from end grains is that these cuts are a little more resistant to stains and absorbing moisture. Don’t be confused if woodworkers use the term flat grain. They are simply using an umbrella term that refers to wood grain from either the edge or the face. As an example, in most maple wood cutting boards, the strips of wood can be glued together randomly, resulting in a mixture of both grains (a.k.a. mixed grain). This distinction is largely one of appearance, but when it comes to building with or maintaining mixed grain wood projects, special attention should be paid to the ongoing MC levels. Wood products manufacturing companies and woodworking hobbyists must understand the differences in shrinkage characteristics between different grains due to changes in MC. This goes to the heart of a key concept in wood products manufacturing woodworking: equilibrium moisture content (EMC). EMC is achieved when the MC in the wood is balanced with its ambient RH, and a wood’s MC continues to fluctuate naturally with changes in RH. Thus, moisture meters for wood are critical in monitoring these changes and represent a sound investment in overall MC management. Too much, or even too little, MC can cause adhesives to be less effective or even ineffective when gluing edge grain and face grain wood strips, as well as between end-grain pieces. 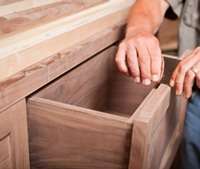 Too much difference in MC between wood pieces when manufacturing or crafting a fine piece of furniture or cabinet can lead to serious and possibly costly defects once in service. Regardless of the wood grain or the type of woodworking project, MC absorption and desorption and the fact that easily 80% of wood manufacturing/woodworking defects are related to moisture are critical reasons to have a high-quality moisture meter. 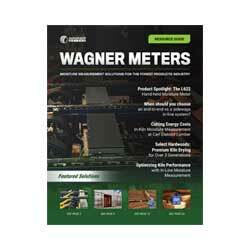 Easy-to-use, accurate moisture meters for wood, such as Wagner Meters’ Orion 930 Dual Depth model, are ideal for measuring MC in nearly all wood species including those very dense and hard species found in tropical climates. Incorrect MC in your wood can lead to disappointing and possibly costly results, but using a quality wood moisture meter can provide tremendous assurance that your woodworking projects will have a successful outcome.